B&K Precision has recently launched its new "pwrApp" for iPad, iPhone, and iPod touch. Adding greater value to its DC power solutions, B&K Precision’s pwrApp allows full monitoring and control of network-connected (via WLAN) XLN-GL series of power supplies over local wireless networks. The primary function of pwrApp is remote operation of all functions of XLN-GL power supplies. Features of the app include live visual monitoring and interactive power supply control, visual data graphing, audible trigger alarms within the app, and export of data. Fully functional in-app demos of devices, monitoring, and programs are available with or without a connected XLN power supply. This is a convenient feature for pwrApp/XLN novices, and persons considering an XLN purchase. 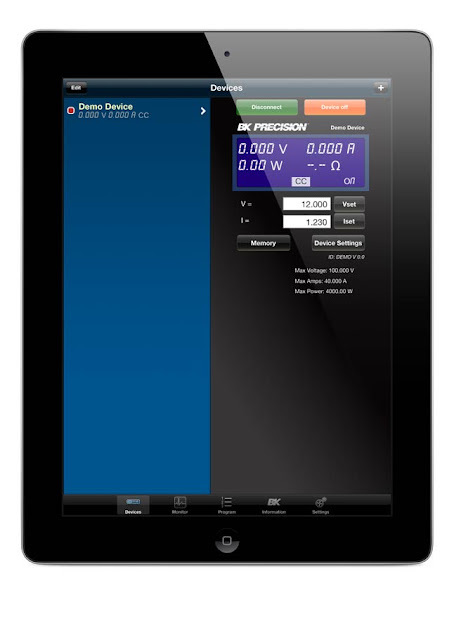 B&K Precision’s pwrApp for iPad and iPhone offers full interface control in English, French, German, Portuguese, Spanish, and Traditional Chinese via a simple selection menu. Future versions of pwrApp will offer control of additional select WLAN enabled B&K Precision power supplies. Available for immediate download via iTunes, pwrApp is free of charge to all users.